There is a myth among the left that Donald Trump can’t stand to be laughed at and ridiculed. You hear it confidently, smugly explained night after night by “expert” guests on every news talk show on MSNBC. That’s them using THEIR set of fears. There’s only one thing Trump cannot stand which is: NOT GETTING ATTENTION. We exist now in The Attention Economy and he is greedy. He lives his life for attention, and he gets it through his deep and thorough intuition for narrative. Laughter and ridicule are not part of the currency, which means they are trivial to him. All of which is beyond the intellectualism of the left. Also, note this for Trump’s Narrative Index (BUTs/ANDs): TRUMP WITH SCRIPT (on Afghanistan) = 6, TRUMP RANTING SPEECH (in Phoenix) = 23. The man knows narrative. 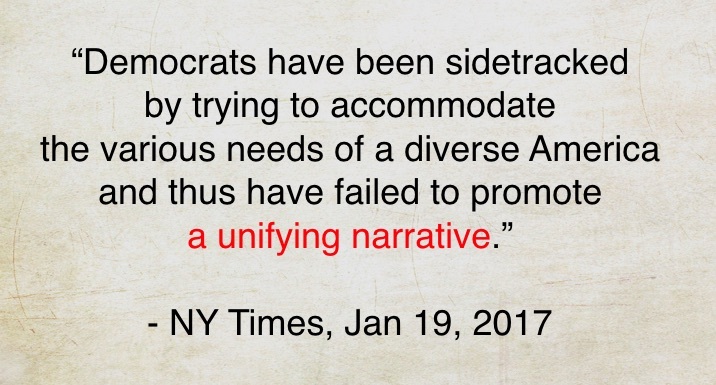 TRUMP KNOWS NARRATIVE so incredibly well, leaving his opponents in the dust. At least for now. For the past 15 years a few very smart people have realized that our core currency has shifted to one central resource: ATTENTION. Starting at the turn of the century books began to emerge with titles like The Attention Economy (Davenport and Beck, 2001) and The Economics of Attention (Lanham, 2006). What I don’t get is why news pundits have not put that knowledge together with the fact that we have THE most attention-seeking President ever, and produced at least some body of thought to explain and predict his behavior. To the contrary, what we have over and over again is massively educated pundits on the left analyzing Donald Trump using THEIR rules of how people should think and act. Which leaves them endlessly baffled. Could they be any more lost? 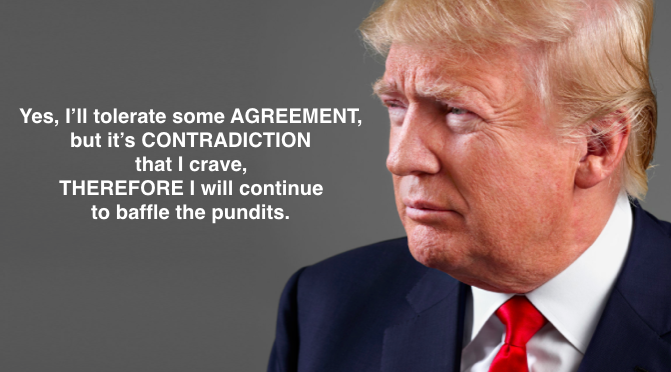 Trump loves CONTRADICTION, the central force of narrative (which is AGREEMENT, CONTRADICTION, CONSEQUENCE). Let me give you a little example of this. CLANK. Way to lay a turd on the festivities. The two hosts didn’t know what to say. It was a day to honor the armed forces. There’s no way Obama or Hillary or even G.W. Bush would have said such a thing. They would have all just rolled with things and said, “Yes, this is great.” Especially Bush. If you doubt that, look at his Narrative Index values (But/And ratio) for all of his State of the Union addresses. Every one of them was under 10 for an average of 4, which is literally the same values as four equipment maintenance manuals I found online recently. He didn’t know how to disagree with anything. There are three fundamental forces of narrative: AGREEMENT, CONTRADICTION, CONSEQUENCE. If you want to understand a lot about your world quickly, start absorbing what those three forces mean. Don’t fight it. Accept that back in the 1700’s Hegel pointed it out with his triad, and then start realizing how the three forces explain just about everything when it comes to communication. Realize that CONTRADICTION is at the core of narrative. Then think about the life of Donald Trump. Day in and day out, every single moment, his life is all about contradiction. He loves it, he relishes it, he bathes in it. One more thing on El Presidente. It’s called The Narrative Index. It’s just the ratio of BUTs to ANDs in any given text. Have a look at this. His Afghanistan speech on August 21 was restrained, controlled and tightly scripted. Look how few times he said BUT — a total of 9. His Narrative Index was 6. Now look at his Phoenix speech last week was a 77 minute rant that was rich in ABT form. Just look at the first part of it. He opens with line after line of AGREEMENT, each of which is followed by applause. BUT THEN, he finally hits his source of contradiction with this line, “But the very dishonest media, those people right up there with all the cameras.” It’s his first BUT. Guess what that line is met with — boos. That’s the start of his central narrative thread, laid out plain and simple. Overall, look at the scores. His boring Afghanistan speech scores a 6, his barn burner Phoenix speech scores a 23. The man knows narrative — when to pull it back, when to lay it on. He continues to be a powerful mass communicator, despite what the eggheads are saying, hoping and praying. When asked for years for good examples of science communication in film I’ve pointed to HBO Real Sports with Bryant Gumbel. Not that they communicate science, they’re just a model for how science ought to be communicated. This month they brought their excellent narrative skills to the Great Barrier Reef of Australia. In this post I dissect what they presented to show why I think they are so good at narrative. This is how true professionals communicate effectively. I wish more amateur documentary filmmakers and scientists in general would learn from them. 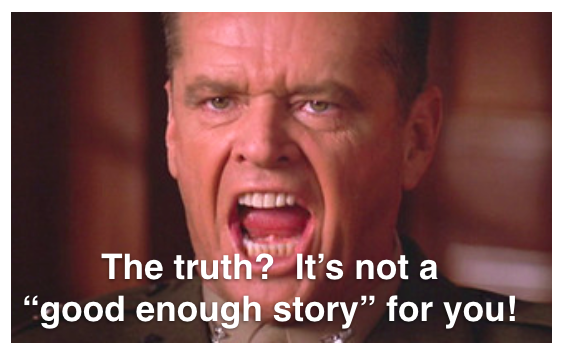 More is not more for media when most of it is so poorly crafted for narrative structure (i.e. stop boring the public). “THE GODFATHER OF CORAL REEFS”! Charlie Veron, one of my old colleagues from way back, sets the world straight on how his own country is killing their greatest natural resource. For years I’ve raved about the narrative skills on display when you watch HBO’s Real Sports with Bryant Gumbel. The show has won two Peabody Awards among other accolades. How do they do it? First off, they aren’t driven by any sort of, “You need to know this” agenda. To the contrary. They have a team of people who scour the world for good stories, even if the connection to sports sometimes seems a little stretched. They look far and wide for good stories, first and foremost. Then they work extra hard to shape the narrative structure into as powerful form as possible. This month they did an excellent segment on the dying of Australia’s Great Barrier Reef. Without making any specific mention of the amateurishness of most feature environmental documentaries when it comes to narrative, I’ll simply focus on pointing out the various key narrative elements that are so well used in the Real Sports segment. Let me start with a few of the key attributes. THREE ACT STRUCTURE – as we say endlessly in our Story Circles Narrative Training, it’s about the three fundamental forces of narrative. They begin with AGREEMENT. Notice that the first quarter of the show has no tension, no conflict, no issue, no problem — it’s “The Ordinary World” to use Joseph Campbell’s terminology. Bryant Gumbel goes snorkeling on a healthy reef and raves about the beauty. In perfect narrative form, the first act ends with CONTRADICTION — i.e. the statement of the problem. This is exactly what they do, stating the problem which begins the narrative part of their story. It’s always hard to pinpoint where a third act really begins, but in their story it’s fairly clear as it occurs when they finally move up to “the big fish” that was hinted at from the start (climate change and the coal industry driving it). Bottom line, the structure is excellent. AROUSE AND FULFILL – it’s the central dictum for mass communication and you see it at work in their three act structure. The entire first act is pure arousal. No information, no statistics, no preachy message — just the pure pleasure of diving on a beautiful coral reef. The narrative process not yet begun — just arousal to start with. The fulfillment will come later, once you really want to know more about this resource. SUPERLATIVES – superlatives are basically statements of X-tremes (biggest, longest, worst, most dangerous, etc.) and are communications gold in a world of too much noise. The challenge is to not over-reach for them. But if you’ve got ‘em, use ‘em. Which is what they do, being the professionals they are. I count ten superlatives, if we include “Godfather” as a statement of extremes. Of course this is a story that is already set in a world of extremes on the GREAT Barrier Reef, but still, they clearly have the eye for all possible superlatives. SPECIFICS – rule number one for story is that THE POWER OF STORYTELLING RESTS IN THE SPECIFICS. You see this throughout the piece. Not vague statements about “this is really important,” but specific information and again, statements of extreme, but only where correct and reasonable. Notice that Bryant Gumbel even asks, verbatim, if Dean Miller recalls “any SPECIFIC moment.” This the pathway to the most powerful form of storytelling — to recall individual, specific moments. DON’T TELL US, SHOW US – twice they yield to this principle — first taking us on a snorkeling trip to a healthy reef, then a few minutes later taking us to dive on a dead reef. It’s the obvious and obligatory footage, but the thing to note is that they weren’t jumping back and forth between the two from the start. No, they took their time giving you a full dose of what a healthy reef looks like. Then they took an equal amount of time to visit the dead reef. These things matter, narratively. REPETITION – this is the bane of artsy filmmakers who never want to “hit you over the head” with things, or be “too on the nose.” And that’s why they are rarely good at messaging. Effective messaging is all about inculcation — repeating the message, ideally in different ways — but sometimes just bluntly saying the SAME damn thing, as they do a couple of times, especially at the end. 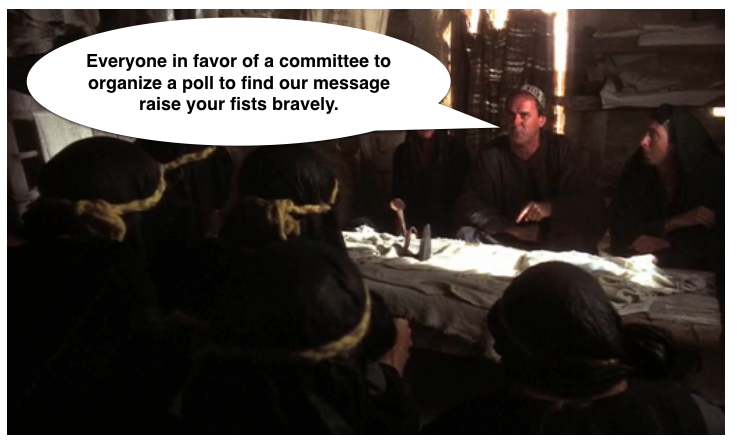 If you’re a fan of John Oliver’s HBO show you may have enjoyed the mission he’s been on showing how the CBS show 60 Minutes egregiously repeats the sound bites of their interview subjects. The host will say, “So that’s what it costs?” The interview subject will say, “So that’s what it costs.” They do it relentlessly. And they are one of the most successful shows in television history. Yes, it’s funny if you look at it analytically, but most of the mass audience isn’t analytical. Which is something that highly educated people have a hard time grasping. Sorry if you think repetition is tacky. So many of my USC film school classmates headed out in the world wanting to be artsy and not say anything too bluntly, but after twenty years in the business they have a completely different understanding of how things work. You wanna get your point across, you better say it loud, simple, and repetitively. That’s the real world. Get used to it, eggheads. STAKES GET RAISED – if you look at The Logline Maker (a 9 part template for crafting an entire story, presented by Dorie Barton in our book “Connection”) you see that step #5 is “The Stakes Get Raised.” You can see that right about the midpoint of the segment. We’ve established that the reef is suffering major problems, BUT here’s what’s worse — the officials aren’t even sounding the alarms about it. What this means structurally is that right about the time the story might be starting to lose momentum they kick it up by raising the stakes. You know how you know to do that? If you have narrative intuition, that’s how. 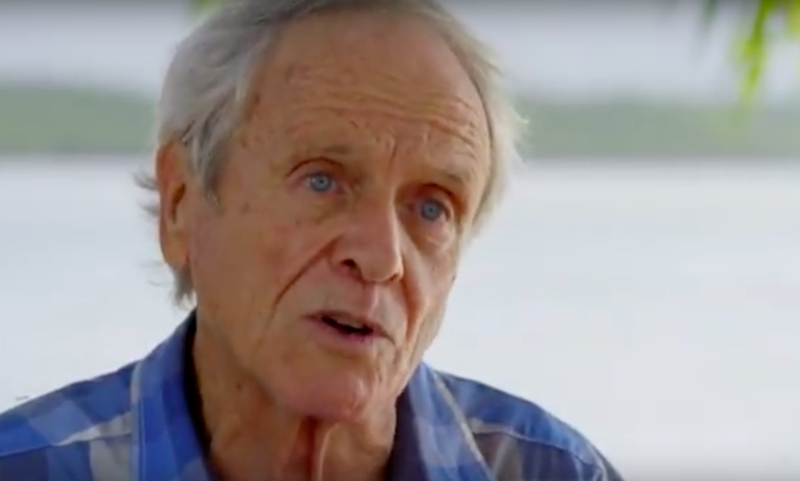 FINAL SYNTHESIS – the segment ends with the double shot of the core message — that the reef is DYING — spoken by both Charlie Veron, then repeated by Dean Miller. Did they cue Dean to say that bit or did the editor just find it in the interview. I’d guess the former. Then they put the visual lid on the presentation with the final aerial shot pulling away from the reef. This is not a fluke. There’s almost no “but’s” in the first act for exactly the reasons I listed above — there shouldn’t be any contradiction in the first act. It’s a place for AGREEMENT. It needs to be free of narrative twists so you can establish the Ordinary World clearly in the viewers mind. Once the second act begins with the statement of the problem, it’s then time to take us on the whole journey full of twists, turns, and raising of the stakes (“But they aren’t sounding the alarms”). BOTTOM LINE – The HBO Real Sports team are incredibly gifted at the challenge of creating effective narrative structure. If you doubt this, just watch the stunning story in this same episode they tell about baseball player Rod Carew and his heart transplant. And I mean STUNNING. The stories they find are so powerful, and often have little to do with sports. Their stories are about what interests humans most, which is HUMANS (not science or coral reefs or climate change). For years I have said the science world could, in theory, produce an equally good program. It would just require one thing — that the producers NOT love science. That is the bane of science programming. Endlessly. The producers always love their science and see humans as inconvenient baggage. 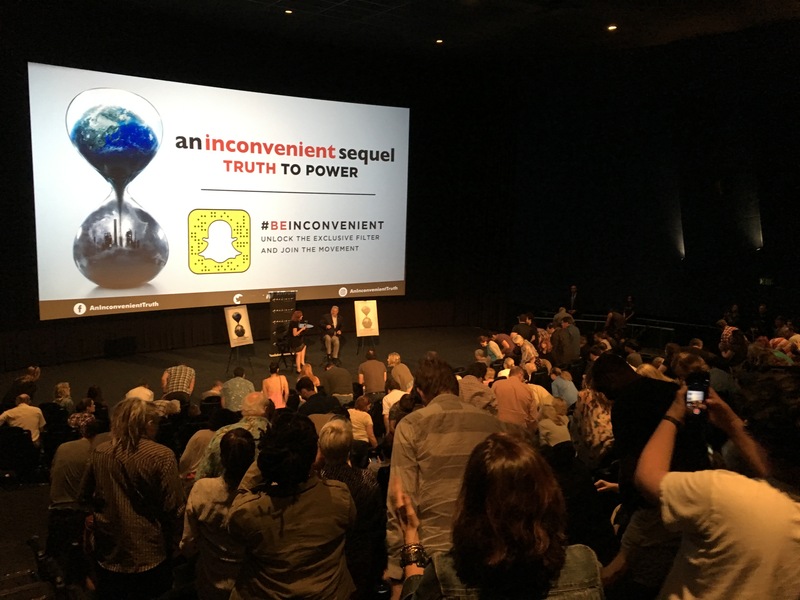 The result is content geared for science lovers, not the general public. And sad to say, given how much I have loved the ocean my entire life, the problem is even worse — much worse — for “ocean lovers” and what they produce. Here’s my crude outline of the segment, showing these points of structure I’ve mentioned. Great Barrier Reef is paradise. Gumbel: Why are so many supportive of coal? 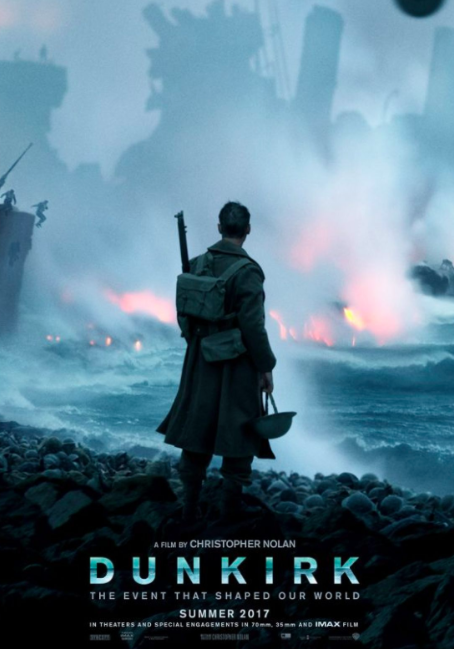 “Dunkirk” is a movie that is excellent (92% on Rotten Tomatoes), popular (made $50 mil opening weekend), and with pretty much flawless, simple narrative structure. In fact, it illustrates what I am hereby and from here on calling “The Get to the Point Rule” for the ABT Template. It is the idea that, “The quicker you can get through the A and the B (set up and problem), the more the audience will let you have all day with the T … provided you’ve set it up right.” Here’s the ABT for “Dunkirk”: The British troops are retreating AND in a month they could all be evacuated safely, BUT the Germans have them surrounded, THEREFORE they only have a few frantic days to escape. That’s it. They go through the A and B in the first minute of the movie. The rest is T, delivered at relentless speed. It’s a great movie. I’m putting a name on this ABT rule I’ve been saying repeatedly over the past year. I’m calling it The Get to the Point Rule. The rule is, the quicker you can get through the A and B, the more we want to hear lots and lots about the T, provided you’ve set it up well. I saw “Dunkirk,” yesterday, thoroughly enjoyed it, and realized it gets through the A and the B in about the first minute. It starts with a couple of screens of text telling you the set up (the British are retreating) and the problem (the Germans have them surrounded). Within another minute we get the first of many THEREFOREs as the actor we’re following runs out on the beach and sees thousands of soldiers standing in line waiting to be transported back to England — i.e. THEREFORE everyone is stuck trying to escape quickly. From there it’s basically THEREFORE men are being killed by the enemy, THEREFORE they need to bring in rescue ships as quick as possible, THEREFORE just standing on the beach is life threatening. And then they start back with a whole series of minor ABTs — BUT there’s German planes strafing them, BUT there’s British planes defending them, BUT the Germans manage to sink a ship next to the pier, THEREFORE other ships will have trouble getting in. Lots of smaller ABTs as the movie moves along the arc of the over-arching ABT. The central problem is the need to get back to Britain. The solution is the fleet of boats that eventually come over (if you think this is a spoiler you don’t know your basic WWII history — also, you might want to hear from a historian about the creative licenses taken). Give the masses a tight, fast paced story and they really don’t need much else (including character work and backstory). Do this and you score 92% with Rotten Tomatoes. Such is the eternal magic of story. Mary Kate Flanagan is from Ireland and is a former student of Frank Daniel, the screenwriting guru who in the 1980’s first pointed out the And, But, Therefore (ABT) dynamic. Last year she won “The Moth” storytelling competition with this perfectly delivered story about her father’s funeral. If you listen close in the first 1.5 minutes you’ll hear the ABT structure plain as day. She says AND 7 times, she says BUT 6 times, she says SO (the more common equivalent of THEREFORE) 4 times. That’s a LOT of structure. I have developed the Narrative Index (the BUT/AND ratio) in the past. A value of 30 for the N.I. is exceptional. Her ratio for that first minute and a half is 86. Furthermore, if you consider her overall structure, you see she follows the MONOMYTH to a tee. She begins by introducing her theme — that there are 6 strong sisters who together can do anything. The Ordinary World is set up (that the father dies and they’re all set to bury him with the sisters carrying the coffin), BUT THEN the funeral director says they’re not strong enough which takes us into the Special World and off on the journey. The problem is eventually solved, then notice where she concludes the story — full circle, back to what she said at the start with her THEME (that the parents gave them all they ever needed in the world — six strong sisters). Not surprisingly she teaches screenwriting and is a member of The Frank Daniel Institute. Kind of helps with the understanding the power of the ABT when you see it so effectively on display like this. The news used to be driven by the truth, at least in theory. Today — more than ever — it’s driven by story (as Trump knows well), which requires sources of contradiction. When contradiction is in short supply, Twitter conveniently provides it. USA Today knows this at a deep and instinctive level. They continue to blaze the path into The Age of Mediocrity. STORY TRUMPS TRUTH today in ways not seen since the medieval Dark Ages. Brought to you by science, technology and Twitter, run amok. Narrative consists of three forces — AGREEMENT, CONTRADICTION, CONSEQUENCE. If you want a solid narrative structure, you need sources of all three. Today’s news media has a ravenous appetite for both contradiction and specifics. Twitter provides both. If I tell you Ann Coulter got into a spat on a flight, that’s moderately interesting. But if I can use Twitter to quote specific words from her AND specific words of opposition, as USA Today does in this article today, it’s much more powerful. Who cares whether the Twitter sources are reputable. Even more to the point, if I tell you Ed Sheeran’s appearance on “Game of Thrones” sucked, that’s moderately interesting. But it’s much more interesting and engaging if I can cite specific voices — regardless of whether they are professional movie critics. Who cares who they are, they are sources of contradiction and specifics — precious narrative fuel. Thus continues our information-glutted sleigh ride into The Age of Mediocrity, overseen by The Master of Contradiction in the White House. And followed suit by the increasingly dull and mediocre Democrats who respect and value the voices of mediocrity. It’s here, it’s there, it’s everywhere you look. Like this article in this month’s issue of The Atlantic. As Aaron Huertas says, it’s like the arrow in the Fedex logo — once you see it, you can’t unsee it. ABTsville. Plain and simple — two opening clauses which could be connected with an “AND” (though would sound clunky), then the BUT, and SO which conveys the same force of consequence as THEREFORE. I continue to wage war against all the old farts who say “it’s not that simple.” Yes it is. We’re definitely making progress. We’ve now run or are running 26 Story Circles. Yesterday we had an “ABT Build Session” with about 20 USDA veterans of Story Circles. It was 90 minutes of discussing and editing about 10 ABTs of the participants. It’s a standard aspect of Story Circles training which is both interesting and productive for everyone involved. 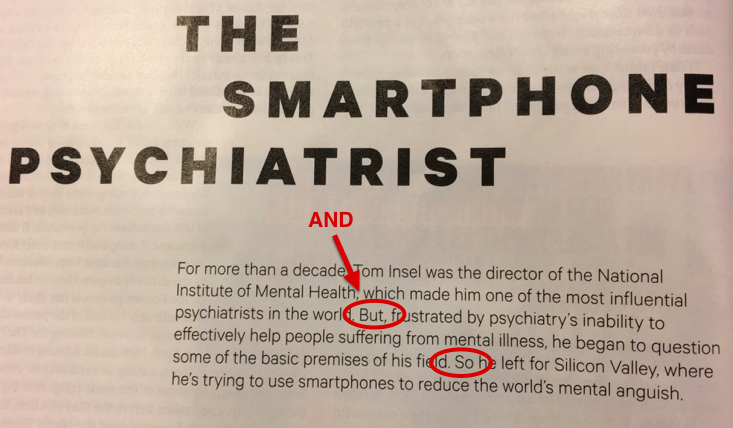 And then this morning I open this month’s issue of The Atlantic and there it is, plain as day — the ABT in the form of the little teaser at the start of an article about a psychiatrist written by David Dobbs who obviously has good narrative intuition. It’s everywhere you find good communication. Yes, it is that simple.